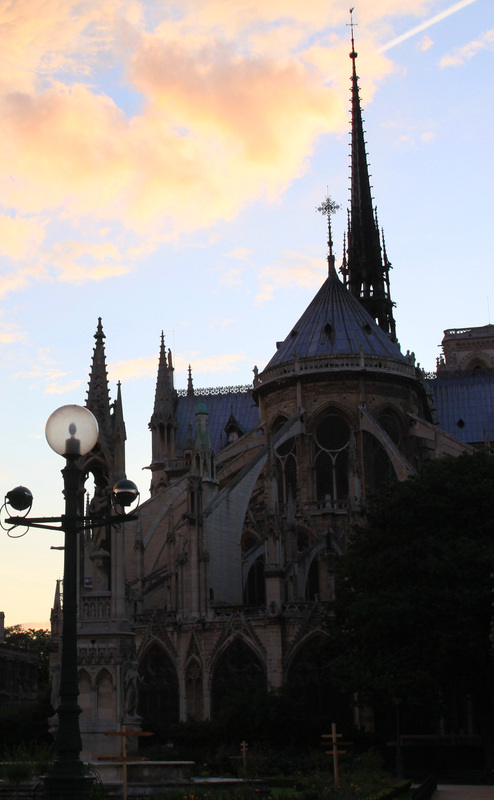 Our neighbor, the cathedral of Notre Dame de Paris, just finished celebrating her 850th anniversary. 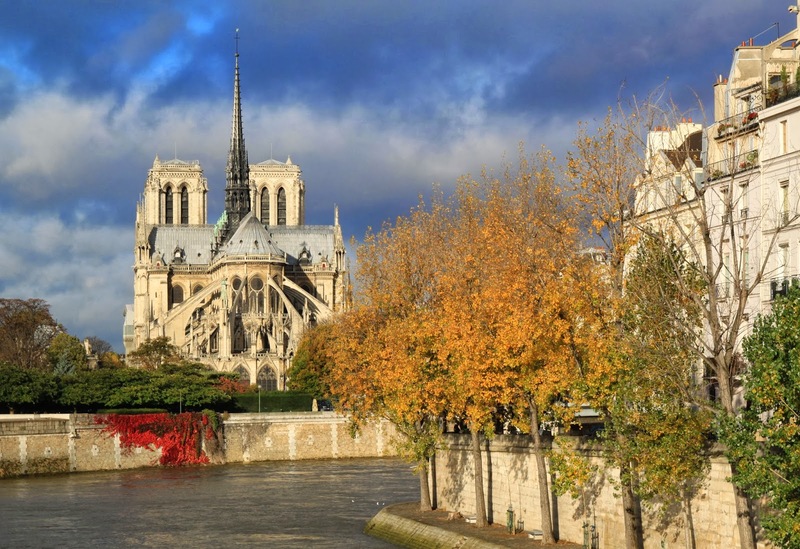 Most people think of the Eiffel Tower when they think of Paris, but to me Notre Dame is the most breathtaking, iconic, gorgeous, evocative monument in the city. Plus, the Eiffel Tower is but a baby at 124 years old. The scaffolding and temporary structure they erected for the anniversary have taken up virtually all of the square and obliterated the view as you approach it. I think "Our Lady" looks much better without this structure, and I started jumping up and down with joy as I walked by this morning and realized they are taking it down, just in time to put up the annual Christmas tree -- always beautiful but different each year. The only tiny advantage of the stadium style seating was that you could climb just a little higher and see the façade, which has recently been cleaned and now gleams a lovely rosy tan. The photos from this angle could only be taken while the stadium seats were up. 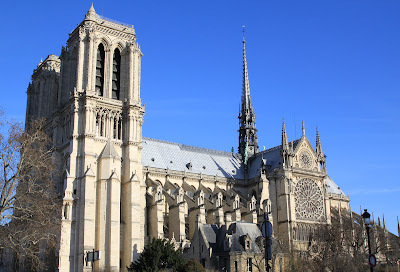 It's hard to imagine what an imposing sight this must have been 850 years ago, when everything surrounding it was medieval Paris -- wooden shacks, narrow roads covered in horse (and human) dung, rats scurrying about, town criers ringing out their bells chanting "Bring out your dead!" When it was built, it would have certainly been the tallest structure any of these people had ever seen, with its cathedral towers soaring over the city. And while Notre Dame may not be the center of the universe, it is -- officially -- the center of Paris. A well-worn bronze star, with the words "Point Zero des Routes de Paris" (Point zero of routes to Paris), is located just in front of the cathedral. Ironically, the plaque is just off-center of the cathedral. The building is decorated with chimeras and the better-known gargoyles, which serve two purposes: as rain gutters and to scare the medieval citizens below into submitting to the church. The best way to see the gargoyles may well be at night, on the north side. Very spooky. 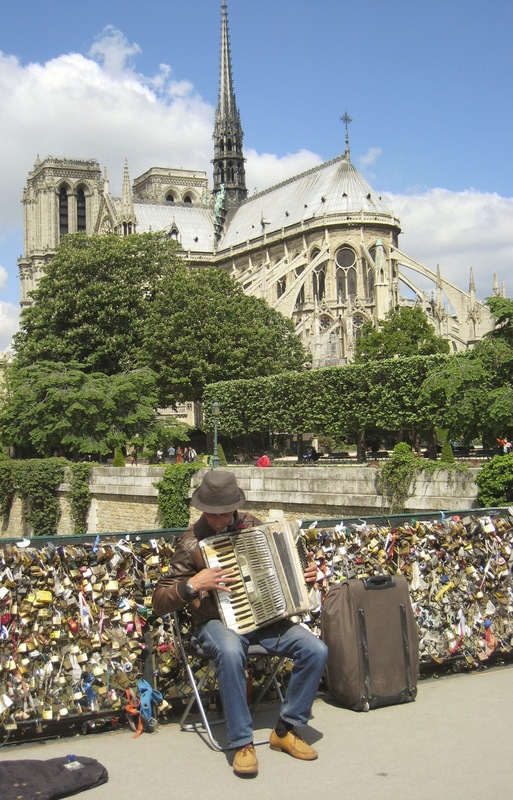 The best way to see the chimeras, however, is from the bell towers, legendary home of Quasimodo. The view from here is decidedly not medieval -- modern building and the Eiffel Tower in the background. We can even see our own apartment from here, though you'd have to know our building very well and have an eagle eye to figure it out. The spire with the verdigris statues -- and the chimeras themselves -- didn't get added to the cathedral till the restoration from 1845-1860. 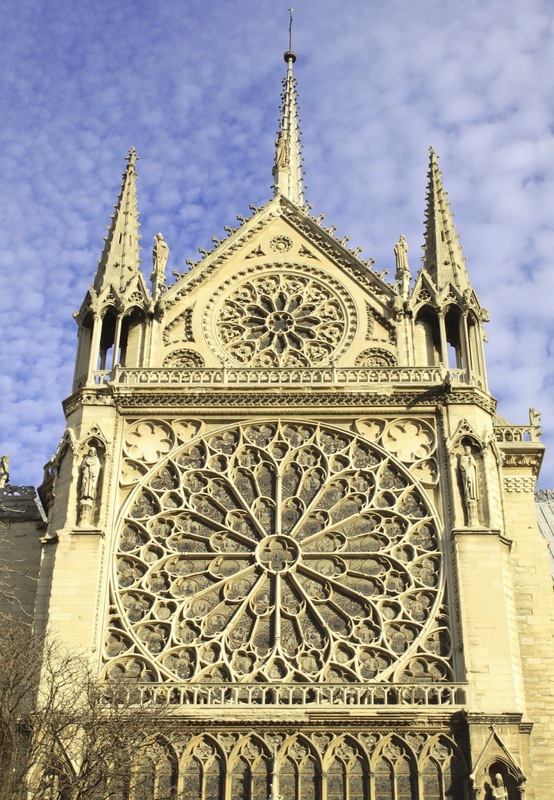 The side fronting the Seine contains one of the famous mid-13th century rose windows. Since it is the south side, and open to the gardens and Seine, it's the one that best highlights the stained glass. The window stands nearly 13m (42ft) high and is said to be comprised of hundreds of thousands of pieces of glass. I don't know exactly; I haven't counted. 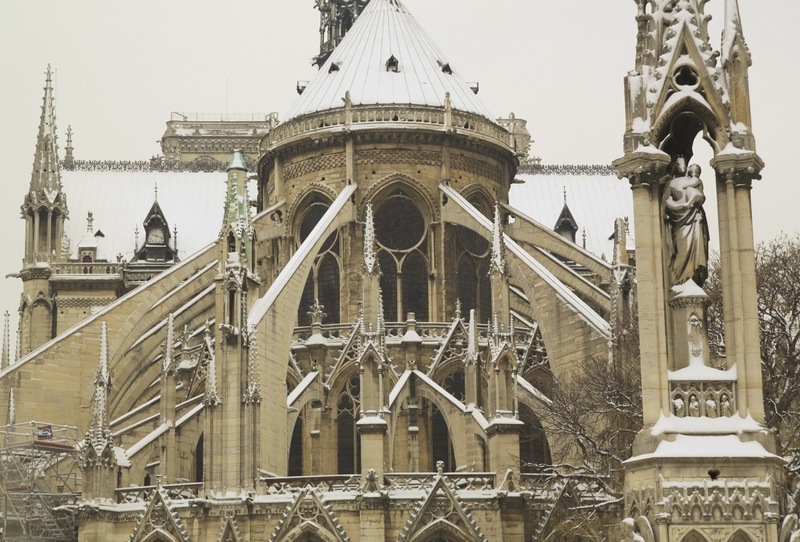 I think this is also the side that best shows off the ornate, intricate Gothic architecture, especially when it looks like a frosted confection. Then there's my favorite side, the back with its flying buttresses. Even before this garden became our front yard (so much so that for the first six months here, Pippa called this place "Ma Dame" -- meaning "My Lady") and the girls' regular little playground, this view has always been my favorite. To me, this is a work of art, a masterpiece, in any lighting, any season. On the inside, the south rose window isn't the only thing glowing. Anyone who's spent time inside Catholic churches will immediately recognize the smell of the burning votive candles. It is, in the truest sense of the word, awesome. Somehow it seems bigger on the inside than the outside. 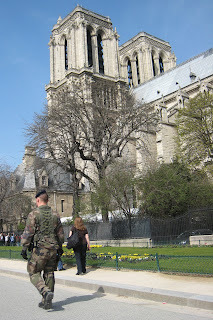 In 850 years, I'm sure a lot has happened in the shadows of Notre Dame cathedral. Just in the two years we've lived here, for instance, we've seen accordionists, newlyweds, marching bands, military guards, some mighty fine roller blading (our daughters), and some mighty awful fake 'staches (our nephews). As you can imagine, this is but a fraction of my Notre Dame photo collection: I have, in fact, so many, many more that I've had to create a special category in my photo files. Using my annual average, I calculate that if I'd been here for the whole 850 years with my digital camera, I would have a total of 213,000 photos just of the cathedral. Happy Anniversary, Notre Dame, and may there be many more. Mark your calendars: I'll see you back here to celebrate her next 850th anniversary in the year 2863. Port Salut is actually a rather modern cheese, from the 19th century, so they wouldn't have eaten it when Notre Dame was being built. It is an industrial version of Port-du-Salut, which is also sometimes referred to as Entrammes. Made from pasteurized cow's milk, with a short affinage of just one month, and formed in medium-sized wheels, it's easy to mass produce and distribute. It can be found in most grocery stores and is not considered a high-end or noble cheese. On the other hand, it's hard to hate. It's mild with a bit of an elastic give, rather like a grocery-store Edam in the United States. While it's not creamy on the plate or under the knife, it melts like a dream in the mouth. It goes in slightly rubbery and turns into salty butter. And that's a good thing. But skip the waxy rind on this one; it's the inside you want. In my Encyclopédie de Fromages is listed a cheese called the Abbaye de la Joie Notre Dame. Naturally, this is the cheese I wanted for this posting. I looked around, then asked around, but couldn't find any. 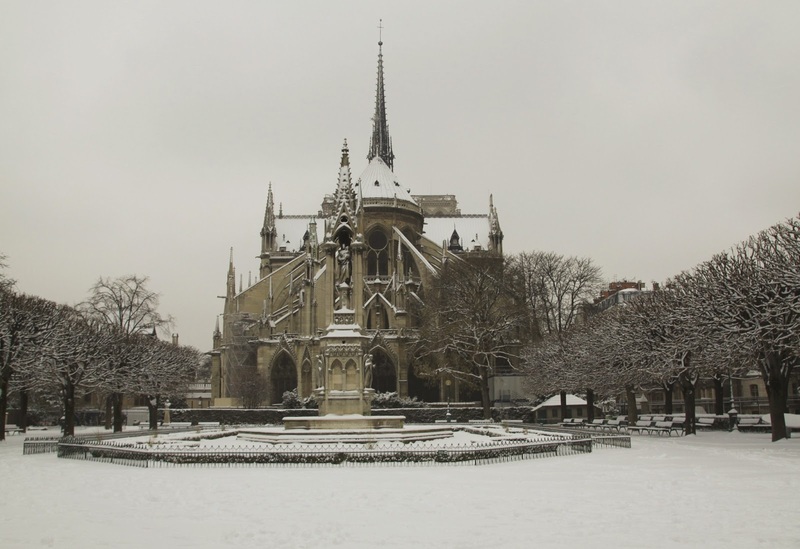 Finally, I called up the abbey directly to find out where in Paris the cheese is sold, only to find out that they ceased production in 1994 (the encyclopedia was first published in Japan in 1993, and so researched prior to that). So, basically, anybody who claims to be selling this cheese is either mistaken, or lying. It simply does not exist anymore. However, by all accounts, this cheese was based very strongly on a Port-du-Salut cheese, so strongly in fact, that it was in essence indistinguishable except for having been made at this Breton abbey. Now true "ancient" style Port-du-Salut is in itself a cheese that is nearly impossible to find, but it gave birth to the more prosaic Port-Salut cheese which, again, is nearly indistinguishable from Port-du-Salut or Abbaye de la Joie Notre Dame. And so, I find myself aiming for a cheese called Notre Dame only to end up at one called Port Salut. But at least it didn't take me 850 years to get there. ha ! I learned a lot, thanks ! I remember I loved Port-Salut and ate it often, in my youth, Its taste had a very slightly sour side, but you don't mention it ... Ha well, tout fout l'camp ma bonne dame ! The same "sour" as in Stracchino (King of cheese, after Imperatore parmiggiano!) Does your encyclopedia say something about Stracchino?